Australia is home to an unusually large number of devoted, creative, and vocal Daria fans, including some prominent writers. A noted yearly get-together is OzDariaCon. In The Daria Database, it is revealed that Daria Morgendorffer has an e-mail penpal named Nicole in Canberra. Nicole has (it seems) criminal ancestors. 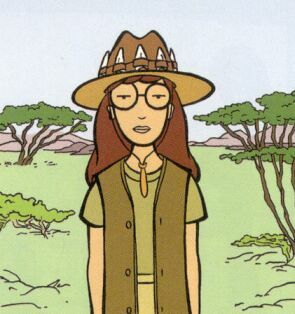 A picture of Daria in outback gear is also supplied. Daria informs Nicole that high school in America is not as glamorous as it seems on TV, and that she doesn't need to worry about Americans judging her on her ancestry: "most people here know very little about Australia except that it's in Europe somewhere." This page was last edited on 12 July 2013, at 02:36.